Tungsten rings are becoming increasingly popular all the time. In the United States alone, almost one third of men are now buying tungsten wedding rings as an alternative to traditional metals like gold or silver. Rising popularity means that the market is always going to become flooded with a range of products. Naturally, some of these aren’t going to be top-notch items. If you decide to buy a tungsten ring, whether as a wedding ring or simply as a fashion accessory, it pays to be able to spot a well-made one. Here are some tips that will help you to do this. If a tungsten ring is 100% tungsten, then put it down and walk away. The highest quality tungsten rings are made from tungsten carbide, which is an alloy of tungsten and carbon, and one of the strongest compounds found on Earth. Always check just to be sure, as stores and online retailers will usually just call all of their products ‘tungsten rings’ just to avoid confusion, and they assume people won’t ask. You can learn an awful lot about the care and attention that has been given to a tungsten ring just by looking at the detail of the finish. If you have a plain tungsten ring then looking at its shape and feeling its texture is the best thing to do. If you’re going for a tungsten ring that has a two-tone finish or has an inlay, then looking at these elements will give you an idea of whether a ring is well made. Look specifically at the areas where the tone changes, or where the inlays join. If you can see or feel seams, or joins don’t run parallel to each other, then forget about buying it. 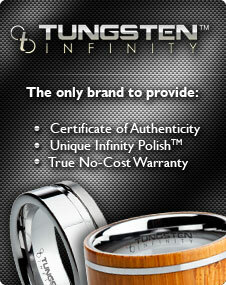 A top quality tungsten ring is durable and never loses its shine. If you’re looking at a tungsten ring in a shop, try to mark it or make it dirty. If the seller is confident in what they’re selling, they should even encourage you to do this, as they know it won’t make a difference. If a few minutes of having the ring in your hand is enough to leave it looking aged, what will it look like after you’ve worn it for a number of weeks, let alone months and years? Speak to the seller about the ring in general, too. A good rule of thumb in a store is that a seller will let a genuine high quality tungsten ring speak for itself; if someone is overselling or is vague about the production process regarding their ring, then it probably isn’t something you want to buy. Money isn’t everything, but the cost of a tungsten ring gives you a great idea of how well it is made. An expensive ring isn’t always an indicator of quality, but the cost of the process means that a cheaper ring is definitely poor quality, so you should avoid these at all costs. Spotting a well-made tungsten ring is easy when you follow the advice we’ve given here. Ensure you’re not caught out and spend your money only on the highest quality products.